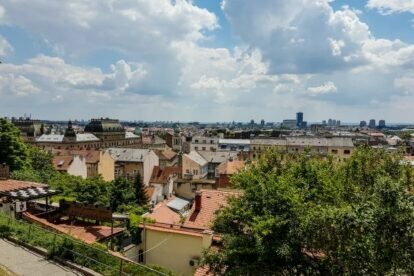 It’s hard to find a romantic couple in Zagreb who never went for a romantic walk on Strossmayer’s promenade, or as we locals call it – Stross. This city has many romantic spots but none like this! Big old chestnut trees, old benches, baroque architecture and the best view of Zagreb’s downtown make this place look like some beautiful scenery from a movie. During December, Stross becomes a part of Zagreb Advent and I never miss it. It becomes almost unreal how gorgeous it gets with Christmas decorations. That is when it gets the most crowded too, but in a good way. Small booths offer delicious food and spicy drinks, the music is great, live and not too loud, and everyone is in a good mood, talking, dancing and just enjoying the holiday spirit. In spring, the old chestnuts start to blossom and the smells become delightful. In summer, I love to stroll here and cool in the shade of the trees. Autumns are spectacular for photographers, with all the leaves changing in so many vivid colors before they cover the ground. No matter the weather or time of day, this promenade offers some unforgettable sights. Stross is only a few steps or a funicular ride from the main square Trg bana Jelačića. Take a walk here or sit on the bench. Take a deep breath and look around. Enjoy! Places like this are why there is the saying “stop and smell the roses”. Or in this case, the chestnuts blossoming.